Don’t inflict rules for bloggers in corporate environments – they’ll do their own thing. API Traps – need to make sure that they’re around for soem time – if they go down what happens? Activity Streams – slow uptake, but people love it. Last October I attended the Future of Social Media conference (FOSM) with my colleague, John Welsh (Digital Director, UBM Information), full of expectation. I was not disappointed. The content and speakers were good and found the practical real-life talks inspiring. After all, most social media-type events cater more for the technical geek-type audiences – not marketers actually going back to an office implementing Social Media (SM) campaigns. Many questions like: what’s the ROI for SMM?, how does SM actually benefit our business? and commonly how do we actual measure SM success – is there a formula? weren’t fully answered in my opinion. British Airways – on the other hand – was particularly useful – managed to coach the audience through Social Media marketing campaigns like the Metrotwin one. This years FOSM conference includes a music theme with Last.fm speaker Spencer Hyman in the line up. A question I’ll have for Spencer is whether the now not-so-recent redesign has had any effect on their audiences? The full speaker line-up and agenda for this years show can be found on the FOSM website. I get to sit down with James Drake-Brockman, Show Director, Internet World, to introduce the Future of Social Media Conference taking place on the 28th October 2008. I recently wrote a blog post indicating that I’d look into the new Sweetcron web app. So, over the weekend I dived in and explored its potential. A Sweetcron is a free and open source solution for creating a self-hosted Lifestream; a blog-like website that shows your activity across the various websites. 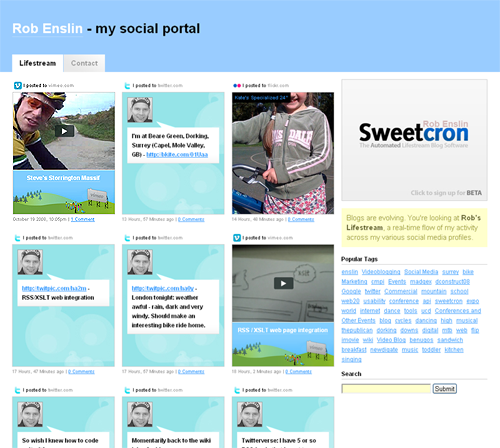 A Sweetcron is very much like a blog that aggregates all your data feeds from your various websites into one site – a website I call my Social Portal. The real beauty of a Sweetcron is the ability to view and comment on individual data-feed inline (no need to wonder off to other websites). A Sweetcron uses the idea of a timeline and gives it the human feel of time progression. Much like the Meghan’s Lifecast where the time is represented horizontally, the Sweetcron uses individual blocks of activity down a mainly vertical axis (is fully customiseable too). What you need to setup a Sweetcron? Lifestream examples: Chris Coyier, Yongfook, Rob Enslin (me) and Satish Kanwar. It’s 7.00am and it’s a lovely morning in Dorking, Surrey. I’ve left my house and walking to the train station. I’m on my way to London Waterloo via Dorking. I chat a little about what I’ve got planned for the day – my Social Friday (media day). Other than continuing with all my wiki rollout sessions – getting folk signed up – which is very time consuming, I plan to take a closer look at Sweetcron (The Automated Lifestream Blog) – web app pulling in all types of content – your social identity, news, videos, blog posts, pownce, tweets – personal social portal. I’m also planning to continuing my work on information architecture documents for a few new projects. This afternoon, I’m looking at thePublican.com‘s spec documents for Firstlight ERA‘s contextual advertising project integration. On the 28th October I’ll be attending the Future of Social Media conference at the Hilton Tower Bridge Hotel. Inspiring insights: unveiling excellence in social media marketing – ensuring businesses recognize and can adopt winning strategies! I’ve been doing a lot of research on this topic – observing what experts are doing and saying. 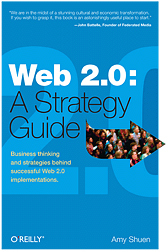 I’ve spent a considerable amount of time scouring the web, reading books like ‘Web 2.0: a strategy guide‘, talking to folk, reading related tweets (from Twitter) and following the #w2e discussions. It’s been extremely helpful, but I still don’t fully understand a total integratiion path (to creating a strategy). My situation is slightly unique, I think, as I’m not building a social media website – I’m ‘plugging’ social media into an exhibition website. I’m wanted to use social media to build new audiences, communities etc.. to support an existing face-to-face traditional exhibition website. Folk at these exhibitions have been meeting in-person for years – to do business, showcasing their products, be seen to being there, networking, etc. So while all my research was taking place I missed one most obvious place – an exhibition/conference website that does social media extremely well (in my opinion) and organised solely for this intent – Web 2.0 Expo New York. The only difference between the two is that Web 2.0 Expo is principally a B2C conference/exhibition whereas my project deals with B2B. I might need to adapt the strategy (perhaps not? ), but I think the principle stays much the same (I hope). So, I started looking around the Web 2.0 Expo website and soon found myself discovering ‘little gems’ splattered everywhere. (Doh – why didn’t I think about this sooner?) The most obvious revelation was the ‘Stay Connected‘ table displaying the various ways visitors to the expo can stay in touch and share their experiences. What better way to communicate with your customers (delegates/visitors) than through a multitude of social media communctaion channels. The principle: use the website’s social channels to communicate (and market the event). The ‘Stay Connected’ table of channels include: Backchannel, Social Network: CrowdVine, Twitter, Facebook Group Attending? 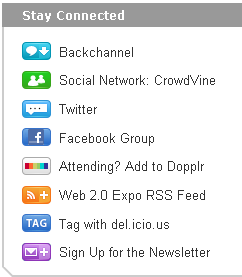 Add to Dopplr, Web 2.0 Expo RSS Feed, Tag with del.icio.us and Sign Up for the Newsletter. So who’s doing the marketing now? Looking at what some folk are saying about Web 2.0 Expo seems that most of the commentary is positive (Dion Hinchcliffe on twitter for example is just one comment). Even if they’re not directly praising the event they’re giving a tangable and non-commercial feel about the expo. As I’ve mentioned most commentators are raving about the event… essentially doing the marketing the job for Web 2.0 Expo. Simple social media principles – communicate on a local level and ‘trust’ is earned. Take a look at the Web 2.0 Expo hashtag tweets. Even the organiser (w2e_NY08) has helped set a non-corporate tone that resonates with the audience (albeit mostly informative tweets). This sort of social media integration doesn’t work within all sectors of business (B2B) exhibitions. In the agricultural sector, for example IOG Saltex, customers are not so digital connected or astute (It’s a huge assumption I know). Even so, by tayloring our social platforms to accommodate our customers, it could work. Perhaps we should be looking at de-commissioning traditional marketing techniques as we know it. What should WE do (or try and do)?